A person can be blessed with immense natural talents, but achieving greatness takes both stubbornness and faith. I just finished reading QB, the new biography of Steve Young, the Hall Of Fame quarterback of the San Francisco 49ers during the ‘80s and ‘90s. Young’s story is inspirational because he had to struggle for so many years of his football career trapped as a backup quarterback while believing he had the talent to be a star if he could just get the opportunity to have the starting job. 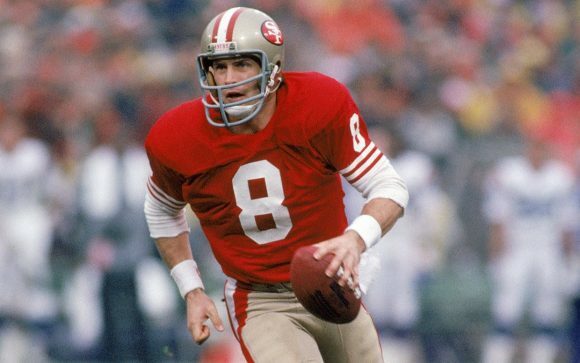 In his senior year of high school Steve Young had straight A’s, was the captain of the football, basketball and baseball teams and went to prom with a girl who eventually would be crowned Miss America. He grew up in a loving middle class Mormon family in Connecticut with encouraging parents who never sought to breed an athletic phenom. At first glance it would seem like things came easy to Steve. He was blessed with natural talent and the drive to workout more than anyone else on his teams, but he had to overcome doubters on his high school, college and professional teams to get starting jobs. After being brought to the San Francisco 49ers with the promise he would start the 1987 season, he had to endure four years of backing up Joe Montana before he was officially considered the team’s undisputed starting quarterback. In high school Young was a poor passer because he had never been taught to throw a football correctly, but he was a fast and fearless runner. When the starting quarterback was injured Young came in and started winning games by running half the plays himself. He played more or less as a quarterback and running back simultaneously. In two seasons he ran the ball 267 times for 1,928 yards, but completed only 41% of his passes, throwing for 1,220 yards. Many colleges that employed a running quarterback offense recruited him. He accepted a scholarship to attend the University of North Carolina where as a freshman he would begin as second on the team’s depth chart at quarterback. At the last minute he backed out because he had an undiagnosed anxiety condition that made him scared to sleep away from home. At the last minute he decided instead to go to Brigham Young University because in Salt Lake City he had family and the Mormon community as a support system. However by choosing to go to BYU he had no guarantee of playing quarterback. He was relegated to the practice squad on a team that utilized a drop back throwing offense. At the time Steve Young arrived at BYU in 1980, Jim McMahon was the starter and one of the best quarterbacks in college football. In the first few days of camp the BYU coaches laughed at Young’s throwing incompetence and told him right away that he would never start at quarterback at BYU because he was left-handed. Their skepticism motivated Young to prove them wrong. Young says “he was attracted to the impossible.” Everyday he stayed after practice and studied Jim McMahon, watching him work out. He studied all his techniques and finally learned how to throw a football correctly. Young describes the release of the ball as similar to throwing a screwball pitch, pushing the ball out of the hand instead of spinning the ball out of the hand as he had previously done. Despite excelling on BYU’s JV team, at the end of Young’s Freshman year the quarterback coach told him that he wanted to him to play defensive back rather than quarterback because he happened to be the fastest guy on the team, and also because he was left-handed. Young was so frustrated that he came close to leaving school to go on a Mormon mission, but he knew emotionally he would not be able to handle being so far away from his family. He asked for advice from a Mormon priest who convinced him that his path was to play football at BYU. In the the spring Young reluctantly began learning to play defensive back, but a few days after being back in school the quarterback coach who had doubted him was hired as the Head Coach of San Diego State. Young suddenly believed he had a chance again to play quarterback. He spent months practicing his throwing in the field house perfecting his technique. One day the new quarterback coach noticed him throwing and suggested to the head coach to take a look at him. After seeing Young’s skills, the head coach decided to give him a chance again at quarterback. Because of Young’s improved skills and some chance occurrences, within weeks he went from 8th to 2nd on the quarterback depth chart. Then Jim McMahon got hurt and Young got his chance to start a few games. He played great, wowing the fans and coaches. After his second game starting it leaked to the press that Steve Young was the Great, Great, Great Grandson of THE Brigham Young, the founder of the Mormon Church, and he was interviewed on Good Morning America. There are actually a lot of grand children of Brigham Young, a result of his 52 children. After Jim McMahon graduated Young became a star in his Junior and Senior years at BYU, putting up staggering numbers in passing and rushing. He finished his college career with 592 pass completions for 7,733 yards and 56 touchdowns, along with rushing for 1,048 yards and 18 touchdowns on the ground. In 1984 people believed Young was destined for greatness in professional football. Instead of going to the NFL he was lured to play in the new pro football league, the United States Football League, where he signed an unprecedented 10-year $40 million contract to play for the Los Angeles Express. Donald Trump an owner of another team in the league, the New Jersey Generals, had been one of several folks who had encouraged Young to join the league. In truth, most of the $40 million would be paid to him as an annuity over 40 years, but fans constantly harassed him, questioning how any athlete could be worth such money. The USFL was a failure and folded two years after Young arrived. He then was forced to go to Tampa Bay, the team that drafted him in the supplemental NFL draft. After two horrible seasons he could see that the team was going nowhere so he told his agent to get him traded to a competitive team. Joe Montana had been injured the year before in San Francisco and many people were saying his career was over. The 49ers legendary coach Bill Walsh told Young that if he came to San Fransisco in 1987 he would become the new starting quarterback. The situation seemed perfect. He would get to play for the best team in the NFL under the inventor of the West Coast Offense. But things did not go as Young had been promised. Joe Montana came back from injury in 1987 and played better than ever. Walsh tried to play both quarterbacks, an unprecedented strategy, sometimes using Young like a relief pitcher when Montana was struggling. Young also got to start for several games that Montana was injured. He usually played great when he had the opportunity to play, which made it especially tormenting for him when he was forced to sit so much. It was especially difficult for Young to watch Montana win back to back Super Bowls in 1988 and 1989. While a backup quarterback from the 1987 through 1990 seasons Young felt that he was not deserving of the money he was being paid, so he often kept his paychecks in a drawer or in the glove compartment of his car, not cashing them until the team made him. After the 1990 season Young was a restricted free agent and seriously contemplated going to the L.A. Raiders, a talented team which had promised him the starting quarterback job. His friends, family and agent encouraged him to go to L.A., but Young wasn’t sure. He spent several weeks praying to come to a decision and he came to believe that if he stayed in San Francisco he would become the starter. If he had the chance to start for the 49ers he much preferred that to starting for any other team. In the second preseason game of the 1991 season, Montana’s elbow flared up with tendinitis. The team shut him down for the season, giving Young his first chance to be the official starting quarterback for the 49ers. Montana would never start another game for the 49ers. When he was finally healthy enough to play again in 1993 he asked to be traded to the Kansas City Chiefs to avoid another quarterback controversy. Young thrived as the 49ers quarterback for many years, winning his own Super Bowl in the 1994-1995 season. It took a while to eventually win over many 49er fans who still wished that Montana was their quarterback, but winning championships can do that. Young only played a full season three times during is 15-year career but his 96.8 career passer rating is the fourth highest in NFL history, the highest among retired players. His 4,239 rushing years are the third highest ever for a quarterback behind only Michael Vick and Randall Cunningham. Question: Who is your favorite quarterback of all time? Russell Wilson, he is a great QB and really great person. Very humble. Great article Noah, as always. I attended my first college game the day Steve was the starter for good at BYU; I fell in love with the game ever since. I moved my machining career back to LA and had a chance to see Steve and the Express practice at Lawndale High while we played softball. Instead of playing, I would watch Steve and the guys practice. Fun indeed. When he joined the 49rs, I became a reluctant fan (always a Ram) but did not get disappointed. as I moved back to Utah, I can tell you that Steve is genuine, humble and does a lot for the community through his Forever Young Foundation. He is a living legend around these parts, a great ambassador for the spot and the church. Thanks for your fine article. Bart Starr, although I am prejudiced living in the Packer Nation. From my perspective as a young kid, Roger Staubach. As a Browns fan a few years later, Brian Sipe. Not the most physically gifted, with an under-average arm. He had smarts, guts and guile. I recall numerous times he got decked hard in the days concussions were only mentioned with car accidents . He’d wobble to the sideline not knowing what day it was. The trainer would wave smelling salts under his nose, and voila’- he’d trot back out to the huddle with a slobbering Jack Lambert waiting to hit him again. Leader of The Kardiac kids! Roger Staubach is my favorite. Loved him at Navy. Saw him go 22 of 24 against Michigan and the two misses were drops. Served in the Navy for four years and then was superb for the Dallas Cowboys. Purest delivery of the ball I’ve ever seen. Terry Bradshaw – not the most talented but always gave everything he had in every game. Great article Noah. I was always impressed with Young’s NFL career for many of the reasons you pointed out but never knew the connection to Mr. Young and my favorite QB of all time Jim McMahon. Of course McMahon was part of the powerhouse Bears of the 80’s, that’s why we like him, but he was always a QB who know how to win. Even with the Eagles McMahon had a great winning record as a starter. In the time period I have been following football, it has to be the very quarterback who held Young back for a few years with the ’49ers; Joe Montana. I watched Joe pull off miracle wins when he played at Notre Dame and he continued that amazing ability to figure out how to win in the NFL. Not the most gifted athlete or pretty passer, but he had a sixth sense about winning. Today, Tom Brady reminds me a lot of how Montana and crew almost aways found a way to win. Gee! Being a Bears’ kid, I’ve come to be enamored with Cutler. It’s always a surprise to find out which QB is going to show up for the game. If he’s on, he’s really good. If he’s off, the TV is off by the end of the half. It can be agonizing. $4.99 CUBS pennant. Wait till next year! Kurt Warner. Great passer, took 2 teams to Super Bowls, great story, great Man.